Fix, fill, seal, and repair virtually anything in 5 seconds or less! Fast & Strong - Create an ever-lasting bond in just 5 seconds. 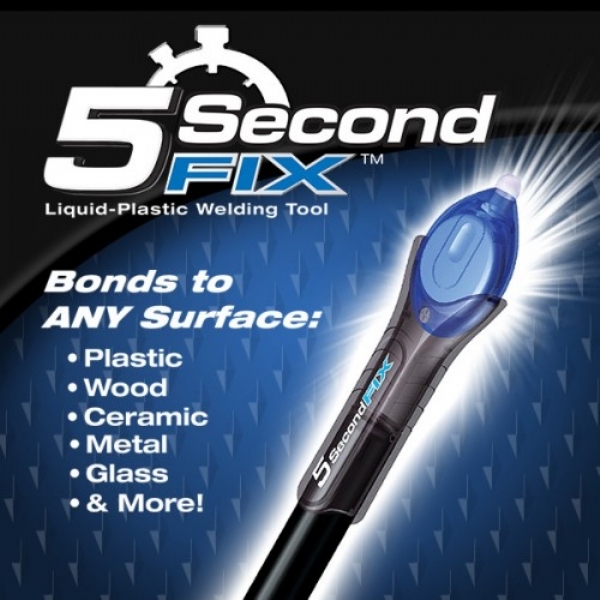 5 Second Fix is a super powered liquid plastic welding compound that you can use to quickly and easily make permanent seals and repairs. As seen on TV 5 Second Fix lets you flawlessly bond everything from plastic to metal, to split wood and broken glass! Unlike glue and common adhesives, 5 Second Fix lets you position and reposition until you want to make the weld permanent. There&apos;s no sticky mess and you can even sand or paint just like New! Worked exactly as stated. What an excellent experience, since it more often is not the case! Thank you. 33 people found this helpful. Was this review helpful? i have repaired 2 cell phone covers, one pair of glasses and a "whirlygig" that fell apart. loved the product. Was not pleased with the 5 second. I glued a set in a ring and it did not last through the day. Would not buy again. 16 people found this helpful. Was this review helpful? The uv light stayed on permanently,the only way I could get it to shut off was to take the battery back. The directions say not to leave light on longer than 5 seconds. Wow! Very disappointed with this product. Didn&apos;t work very well at all. Good utility tool to have in the home. Strong bonding property, and good for a wide variety of uses. Use it all the time. I even ordered 2 more. Works great. IT did not work very well. I had to use it all for naught. Great for the project but I suggest getting more than 1 because the company is very stingy with the amount of glue. I have to get more to finish my project. So far it hasn&apos;t worked well for me on hard plastic. I tried making a plastic repair and it did not work. The pen did not have very much product in it. Seemed like only a few drops!!! I was disappointed with this particular product. Most of the other products I have purchased were really good. It didn&apos;t work too well for my china cabinet and my writing desk. Very unhappy. Money wasted. I love this product! It has saved me for many fixes! Strong, easy-to-use..I even bought one for my father! I Haven&apos;t used it yet; but I expect it to work just fine when I need it. This is a must have for all us do it ourselves out there. This product can fix anything that is broken and fast. It is not a glue but some kind of other substance that will put most anything back together and fast!! Awesome Product!!! Seems to work good,just like they say. It took longer than anticipated otherwise the product is great!.but I do realize it&apos;s that time of year. I will be buying many things from this company it feet like I have my own �in&apos; for the ASOTV. I can get what I want without having to go to many sites. Great Product! Easy to use. Strongly reccomend. Great product! Easy to use and works well in tight spots. It&apos;s quick and the bond is strong. It hasn&apos;t failed me yet on wood, metal, ceramic and glass. Never again will I buy supper glue. No more mess. No more panic when something breaks while the wife&apos;s out. Works pretty well. It&apos;s really just like super glue. Not sure if the little blue light makes a difference. Works like a gem, I have used it to repair 3 items and all got fixed with no issues, no re breaking after fixing, so it bonds very well and keeps the bond. This works as advertised. I fixed my charging cord with it & I am pleased with the results. I recommend this product. So far I&apos;ve fixed three different things that were broken and it has worked wonderfully. I originally bought it to fix one of my grandson&apos;s toys, I had tried a number of different glues. None of them worked.5 second fix fixed it.